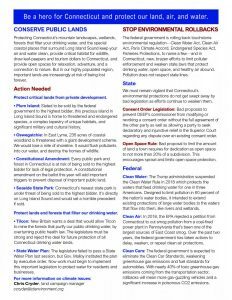 We are gearing up for the upcoming legislative session to ensure protections for our land, air, and water. Protecting Connecticut’s mountain landscapes, wetlands, forests that filter your drinking water, and the special coastal places that surround Long Island Sound keep your air and water clean, provide critical habitat for wildlife, draw leaf-peepers and tourism dollars to Connecticut, and provide open spaces for relaxation, adventure, and a connection to nature. But in our highly populated region, important lands are increasingly at risk of being lost forever. Wildfires, droughts, intense storms, and threatened coastlines are part of nearly every news cycle. Climate change is real and it is happening right before our eyes. The same pollution threatening our global climate brings smog across our state, impacting the health of your family and neighbors. The good news is there are solutions that protect your health while strengthening our economy, like creating thousands of good paying jobs, and attracting and keeping young people in Connecticut. 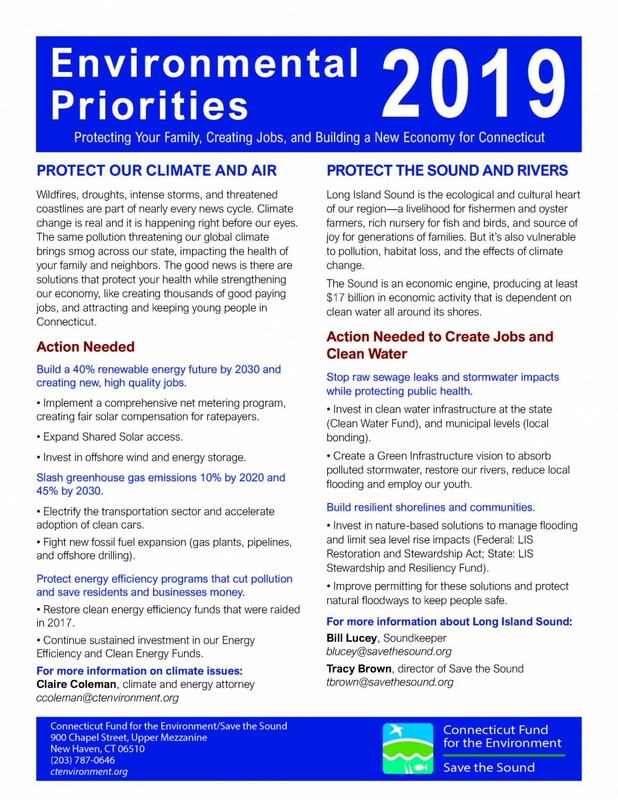 Long Island Sound is the ecological and cultural heart of our region—a livelihood for fishermen and oyster farmers, rich nursery for fish and birds, and source of joy for generations of families. But it’s also vulnerable to pollution, habitat loss, and the effects of climate change. 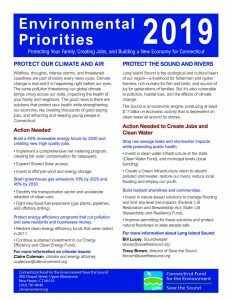 The Sound is an economic engine, producing at least $17 billion in economic activity that is dependent on clean water all around its shores. 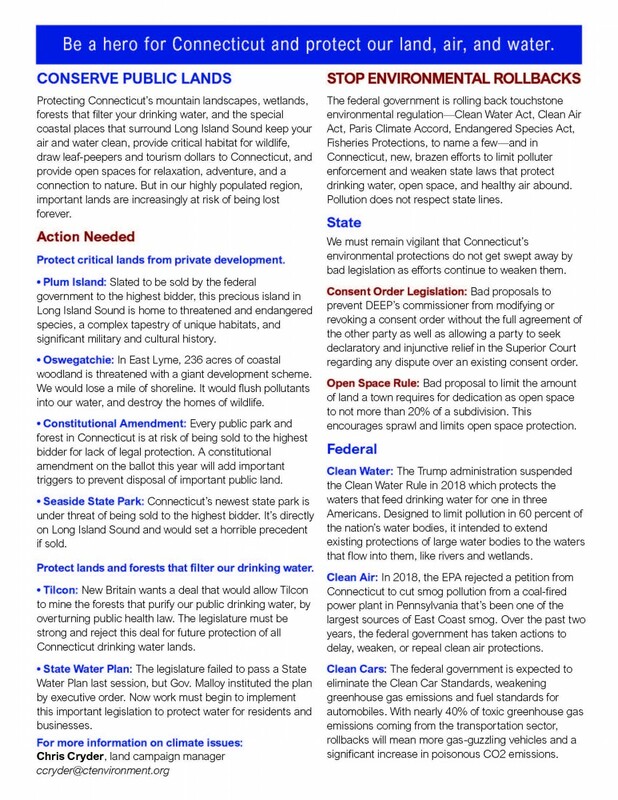 The federal government is rolling back touchstone environmental regulation—Clean Water Act, Clean Air Act, Paris Climate Accord, Endangered Species Act, Fisheries Protections, to name a few—and in Connecticut, new, brazen efforts to limit polluter enforcement and weaken state laws that protect drinking water, open space, and healthy air abound. Pollution does not respect state lines.